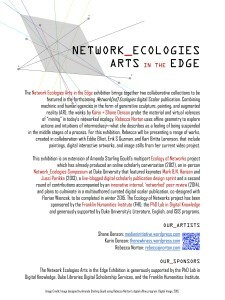 The Network Ecologies Arts in the Edge exhibition will bring together two collaborative collections that will be featured in the Network Ecologies digital scalar publication. Combining machinic and human agencies in the form of generative sculpture, painting, and augmented reality (AR), the works by Karin + Shane Denson probe the material and virtual valences of “mining” in today’s networked ecology. Rebecca Norton uses affine geometry to explore actions and intuitions of intermediacy – what she describes as a feeling of being suspended in the middle stages of a process. 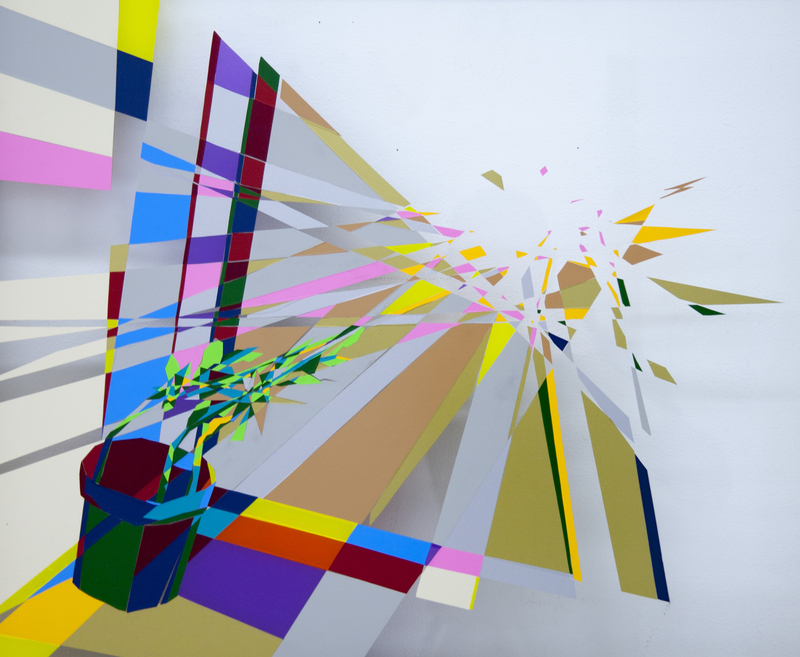 For this exhibition, Rebecca will be presenting a range of works, created in collaboration with Eddie Elliot, Erik S Guzman, and Kari Britta Lorenson, that include paintings, digital interactive artworks, and image stills from her current video project. This exhibition is an extension of Amanda Starling Gould’s multipart Ecology of Networks project which has already produced an online scholarly conversation (2012), a successful in-person Network_Ecologies Symposium at Duke University that featured keynotes Mark BN Hansen and Jussi Parikka (2013), a live-blogged digital scholarly publication design sprint and a second round of contribution accompanied by an innovative internal, ‘networked’ peer review process (2014), and plans to culminate in a multiauthored curated digital scalar publication, co-designed with Florian Wiencek, to be completed in winter 2015. The Ecology of Networks project has been sponsored by the Franklin Humanities Institute (FHI) and the Duke PhD Lab in Digital Knowledge, and generously supported by various Duke University departments. The core Network Ecologies Arts in the Edge exhibition will be open from April 20, 2015 – August 2015. On April 20, 2015 we will have an opening event with artist talks, hands-on demonstrations, and one-day exhibitions by our artists that will include a giant AR gnome, an AR treasure hunt, and a screening of a networked video that will be projected onto the walls of the Duke Edge Digital Research Commons. 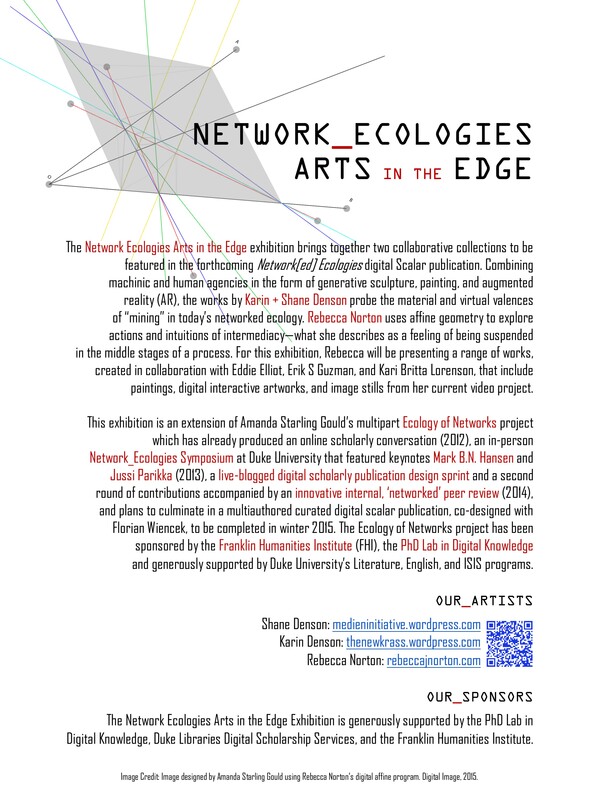 The Network Ecologies Arts in the Edge exhibition and event will be co-sponsored by the FHI, the Duke PhD Lab in Digital Knowledge, and Duke Libraries Digital Scholarship Services. 4:30 Mini Hands-on Digital Arts Workshop with Artist Rebecca Norton – make your own digital affine image! To better observe the mathematical and pragmatic nature of affine geomtery, Norton partnered with programmer Eddie Elliot. Together they produced Sticks – an interactive site that allows users to see various translations of space following the rules of parallelsim that apply to affine geometry. In this 30-minute hands-on digital arts workshop, you’ll learn to use this site to create your own Sticks digital drawing.